Chile wasn’t really on the main agenda for our south America trip, but I couldn’t resist adding a few days to fly the world famous Iquique! 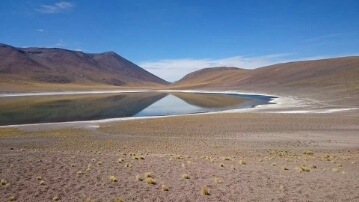 As I researched it a little, a sort of plan started coming together; a few days flying in Iquique, then through the desert and across the border into Argentina, gradually making our way down flying through the Andes and Central Sierras. But it’s really best not to get too attached to your plans! As it turned out, Iquique didn’t really go our way. After our 26-hour marathon from the south of Mexico, we arrived exhausted! We watched all the pilots pile into jeeps and head off to Palo Buque – a giant sand dune just south of the town. Confident that we’d be joining them the next day, we fell into the most comfortable bed we’ve had in months and siesta-ed the day away. Our confidence turned out to be misplaced, however. 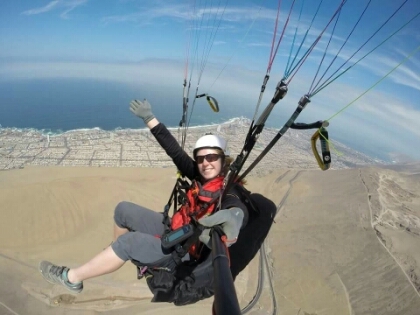 The Dakar rally was rolling into town and all paragliding was grounded from 1pm the next day for five days – almost the exact length of time we were expecting to stay there! We had only one opportunity to fly, so headed up to take-off about 10am the next morning for a couple of hours thermalling over the dunes. First impressions are that it really is an easy place to fly. Two buses take you from the Altazor flight park direct to take-off within about half an hour and you can land right back at the flight park or on the beach in town for ice cream. It starts off fairly smooth. When the thermals start feeling beyond your comfort zone, it’s time to head down for lunch. Pilots rocking up to the site for the first time just need to pick the brains of those who have been there a while to get a briefing and tag along with someone going to take off to work out where to get off the buses. You can also team up with other pilots and borrow a vehicle to go to different sites, the supermarket or anywhere else you need to go. Apparently January isn’t the best time to go – November and December are meant to be the best. But it’s still one of the easiest and most reliable sites we’ve come across! We weren’t able to fly again though, so headed off into the desert. 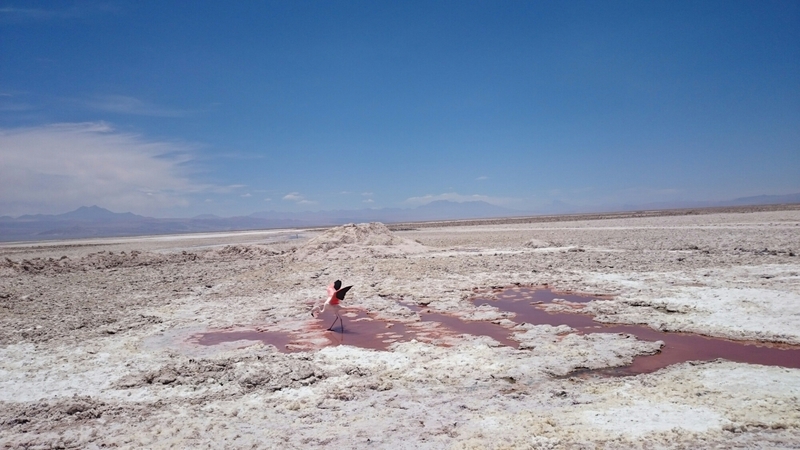 San Pedro de Atacama is a small isolated town, the last stop on the road to Argentina and Bolivia and the jumping off point for tours into the desert and Andes. With limited time and no transport of our own, we decided the simplest way to experience the area was to submit ourselves to the mercy of a tour operator for two days of intensive tourist action. Thanks Chile, it’s been great! We’ll be back for sure!